FLEXA protective metal conduits perfectly well meet the high-precision requirements defined for sensor technologies due to their small dimensions. Food-safe conduits made by FLEXA feature a smooth and an easy-to-clean surface. Protective tubings made by FLEXA and designed for the railway industry. FLEXA protective conduits offers special products to be applied in machine construction. Such products feature high mechanical impact resistance and abrasion resistance. Protective conduits made by FLEXA to be applied on robots are most durable thanks to an optimal combination of material and profile geometry. Cable protection systems for offshore applications in the oil and gas production business need to withstand extreme environmental impact. Applied ashore or on the open sea – the sturdy FLEXA protective conduits will resist any weather and any mechanical stress as well as any damage caused by rodents. FLEXA protective conduits do not only provide for troubelfree operation in terminals and distributors, they are also readily applied in the semiconductor industry. FLEXA products protect cables and lines applied in shipbuilding against weather-related and chemical stress. We are a training company out of conviction and are pleased to further develop our staff with comprehensive on going education. Constructive suggestions are always appreciated at FLEXA. 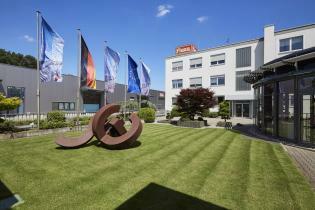 The seedbet of FLEXA was the “Steinheimer Metallschlauch Fabrik“, established in Hanau-Steinheim, Germany, back in 1947. In 1956, the company was taken over by Mr. Karl-Heinz Stenger. FLEXA Quality Management is certified as per DIN EN ISO 9001. Quality is an integral part of our working processes. FLEXA cable protection systems are applied all over the world – and they come with all international certifications and permits. So the user can be sure: FLEXA products can be trusted! Our various certificates, such as QM system DIN EN ISO 9001, can be downloaded! Our prevailing FLEXA Principles of Conduct are to provide unambiguous guidelines for our entire staff on how to deal with each other. These Principles constitute binding internal standards based on applicable law and apply to any of our business activities. New cable protection systems: get updated! FLEXA Cable Protection Systems with more than 3.500 FLEXA quality products. Discover the FLEXA special brochures for different areas of applications. More than 2,000 FLEXA 3D models as CAD files free of charge are available. Selction criteria for protective conduits, chemical resistance, VDE specifications – please find here all valuable information! Demonstration of the FLEXA protective conduit systems and assembly instructions for our connectors. Find out about our general terms and conditions. Find out about our general terms and conditions of purchase. Our Newsletter will provide you with latest innovations from the FLEXA universe. You are welcome to use the extended functions of our download section once you have registered as an Exclusive Partner. This partnership will also grant you access to certain technical documentation as well as to special information. FLEXA Headquarter. Short ways, quick answers: contact details for your convenience. FLEXA german agents and distributors. Our agents and distributors in Europe. We at FLEXA actively set an example of partnership – and also involve our international agents in this partnership. Product news, new videos or upcoming trade fairs – we keep you up to date. FLEXA stands for decades of expertise, comprehensive know-how, and state-of-the-art technology. Demonstration of the IP protection classes for our products. Overview of our international exibitions. The FLEXA metal tubings with their tiny dimensions perfectly meet the high-precision requirements defined for sensor technologies. FLEXA liquid-tight and food-safe conduits feature a smooth and an easy-to-clean surface. Protective conduits made by FLEXA and designed for rail vehicles prove themselves not only in terms of reliable mechanical protective standards but also in terms of good fire protection properties. FLEXA protective conduits to be applied in the field of mechanical engineering feature a high level of mechanical impact resistance and of abrasion resistance.